Now taking bookings for 01 August 2018 – 31 August 2019. To find out when the All Things New Tour is coming to a town near you, please click here to visit the Events page. 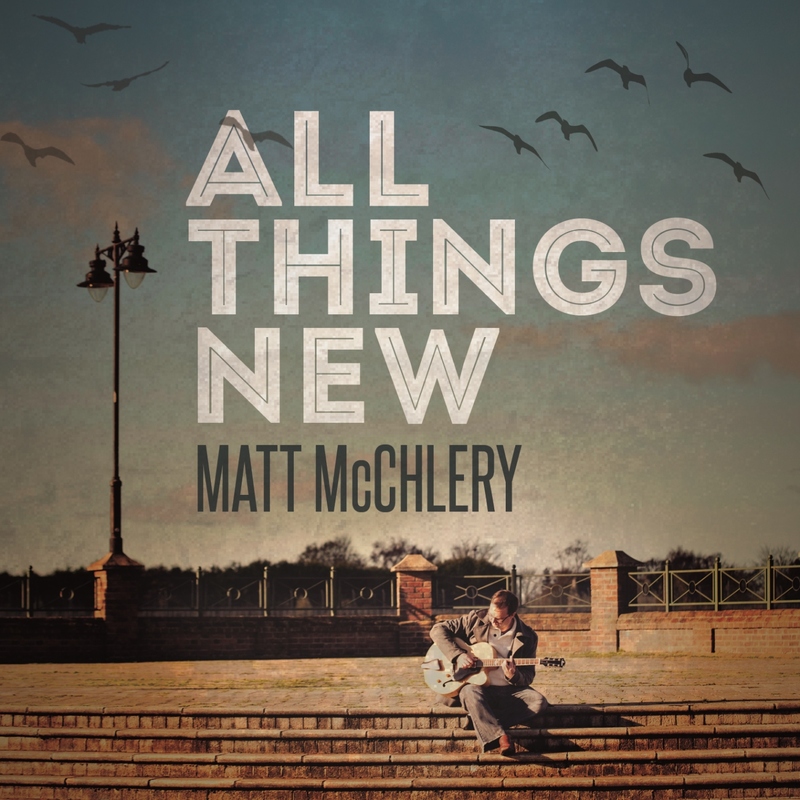 Speaker, author and songwriter, Matt McChlery, has recently launched his ‘All Things New’ project which includes a 6-track CD of songs that explore the theme of salvation and a paperback book that not only tells the stories of several people and the circumstances around which they came to meet Jesus for the first time, but also includes a chapter explaining what salvation is and why we need it as well as extending an invitation to the reader to meet Jesus for themselves. An ‘All Things New’ evening can be hosted by any church who wishes to reach out to their community and to encourage their existing congregation. There are a few ways the evening can be structured and will work with a small group in a living room as well as a large event in a big hall or church venue. Matt is very flexible and is happy to adapt to your particular situation. It is designed to be an informal event. The Launch event saw everyone sitting in-the-round with the band in the middle and the audience just behind them in a circle. The musician could become part of the circle, or the set up could be the more formal musician at the front with an audience watching in rows of seats. It’s up to you. What was your life like before you met Jesus? What is your life like now after you have asked Jesus into your life? The evening lasts approximately 1 hour, or a bit longer depending upon how long the testimonies take. The Wall of Answered Prayer is an initiative that aims to build a national monument made of 1 million bricks with each brick representing an answered prayer. People are invited to send in an answer to prayer which will then form part of this national monument that people can come and experience and be reminded of God’s faithfulness. As testimonies are being shared as part of this event, Matt thought it would be appropriate to include a little bit about ‘The Wall’ where everyone at the event is invited to send in an answer to prayer, if they would like to (flyers at the event will give details on how to do this). There is also opportunity for a representative from ‘The Wall’ to attend the event, however this will incur an additional cost to cover travel expenses from Leicester. Please indicate on your booking form if you would or would not like to invite a representative from ‘The Wall’ to the event too. They will come with literature, flyers and advertising banners to let people know about this exciting project. Special Guests: 2 people from your local church willing to give a testimony, and Gregory Smith (Representative from ‘The Wall’ – optional). Matt can also invite people to accept Jesus as their Lord and Saviour, but is equally happy for the host church to do this in their way if they prefer. PA/Lighting: Matt can bring his own PA system which is suitable for a venue up to around 100 people. Basic lighting can also be provided if needed. Possible Local Support Act: the organiser is welcome to invite a local musician to have a 15min support slot before Matt McChlery’s performance. This is to be organiser by the host church event organiser. Digital Tour Poster/Flyer: this will be emailed to you for use to help promote the event locally through print and on digital media such as Facebook. There is empty space to help you add your own event details. The tour aims to fit in and around your church programme. As such it is open for bookings from 1st July 2018 – 30th June 2019. To be arranged by the artist. Ministry of Music usually takes a non-refundable deposit to confirm tour bookings. The remaining balance will be collected on the night of the event by the artist. Venue available a minimum of 2 hours before doors open and 1 hour after event finishes. Parking spaces for vehicle unloading and parking. Merch table. Event organiser to provide sales person if possible. 2 people from host church willing to give their testimony of how they came to salvation in an interview style section during the event. Times can be adjusted as necessary if local support act not available or if need to fit into an existing event schedule. Artist – email event/church contacts and spread word on facebook/twitter etc. + anything else you can think of to get the tour publicised (local papers etc). Please contact bookings@ministryofmusic.co.uk to find out more and to make a booking. MOM will send out booking agreement/information to you and the booking will only be confirmed once the completed booking form and deposit is received by MOM.